I recently finished these two baby quilts. I LOVE them both. I especially love the pinwheels, but both are just super adorable. The log cabin blocks reminded me of butterflies for some reason. I know, I’m weird that way. So, I did individual butterflies in the scrappy parts of the log cabins and frilly feathers in the white parts. The white fabric on this was a somewhat sheer fabric with a raised design and it turned out beautifully. 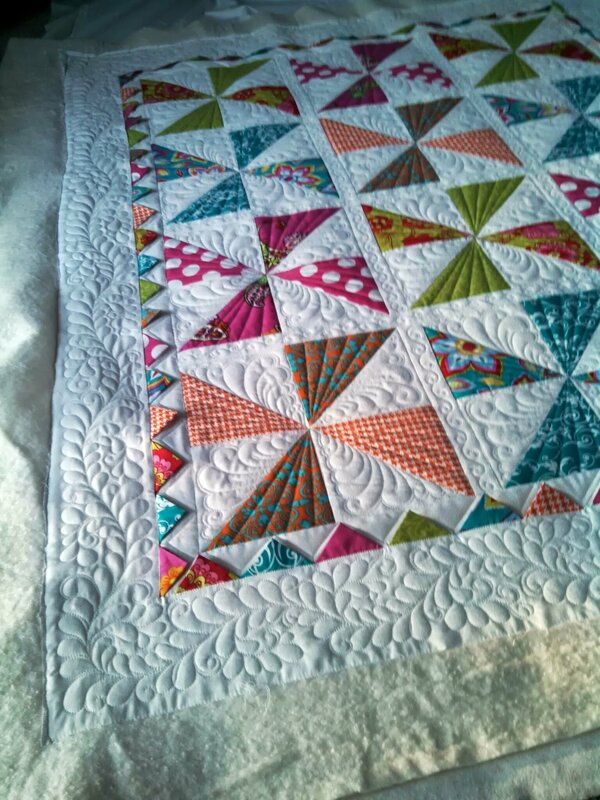 I used Legacy cotton batting and white SoFine/Bottom Line threads. 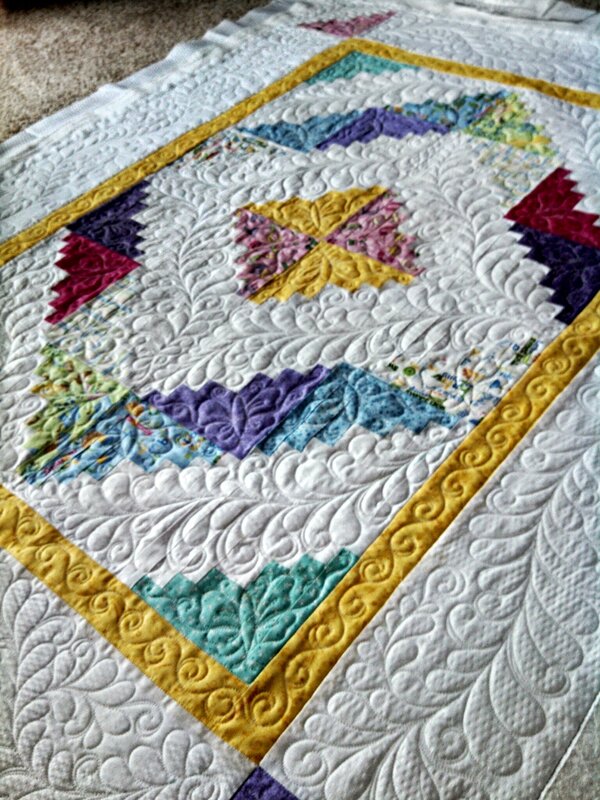 The pinwheel quilt got swirls of feathers and radiating lines. I really, really like how that turned out. I wanted to keep this one for myself. I guess I’ll need to make my own. 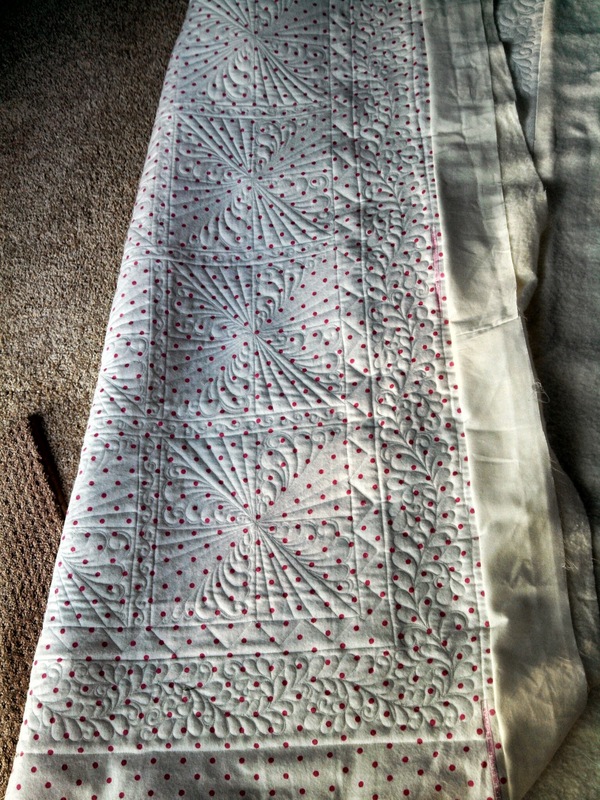 I used Hobbs cotton batting and white SoFine/Bottom Line threads. The backing fabric was pink polk-a-dot flannel. I really liked the Hobbs batting. I think I’ll buy some more of that! 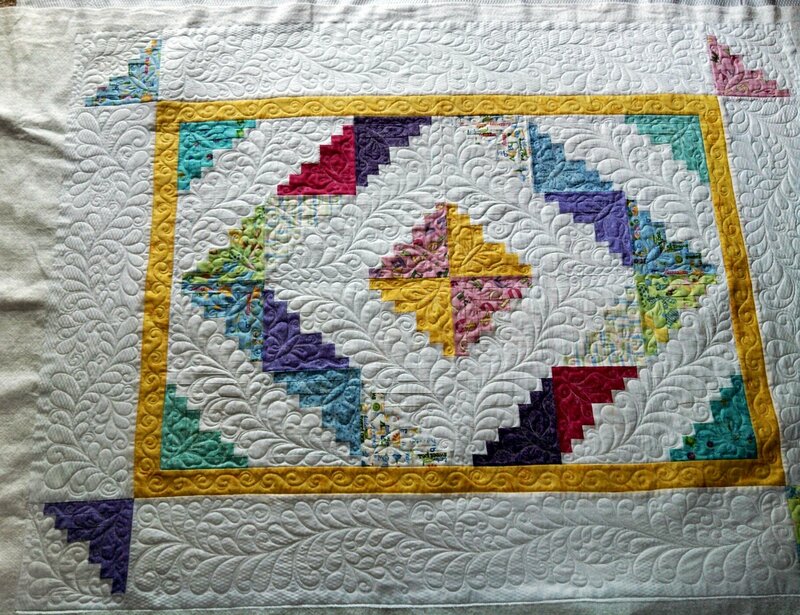 Hi Joy ~ the pinwheel quilt is the one my mother-in-law & I made for my first granddaughter. It was delivered to me last night and I cannot tell you how gorgeous it turned out! I was not thrilled to use bright colors for a baby quilt and kept thinking that I’d made a huge mistake. 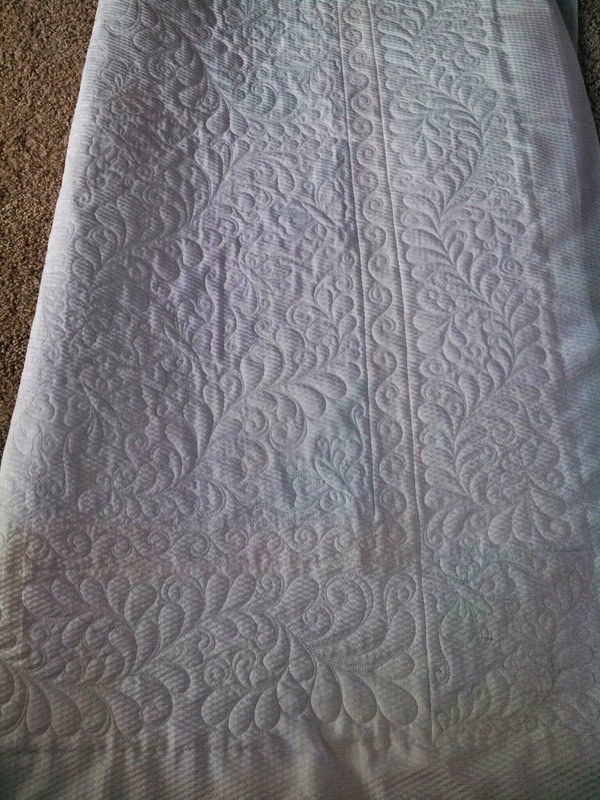 The difference that your quilting made is unbelievable! 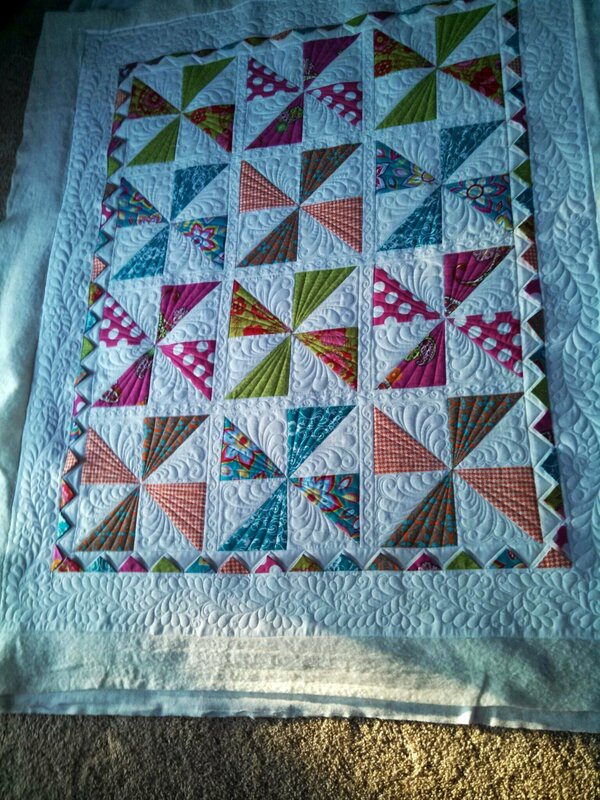 It brought it all together and now I feel that the quilt is an heirloom that she will cherish and hand down. Thank you SO MUCH!!! I am SO glad you liked it. I appreciate your comments so much. 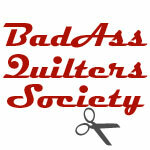 I always hope MY vision for the quilting matches YOUR vision for the quilt. I think your fabric choices were excellent for a baby quilt. Color AND texture are perfect for babies. Hello! So nice! I’ll be a grandmother in december and you gave me a good idea what to do. Thank you for sharing your work! Have a nice week!